Tuesday evening, President Donald Trump addressed a joint session of Congress for the first time as president. The speech, similar to a State of the Union Address, allows the president to lay out the policies that lead Congress and set goals for the Administration. In keeping with tradition, Trump seemed to adopt a less confrontational tone. He also used language appealing to common national identity and denounced recent attacks on Jewish cemeteries and community centers. “I am here tonight to deliver a message of unity and strength and it is a message deeply delivered from my heart,” he said at the start of his speech. Trump’s tagline announced by his staff before the speech, “the Renewal of the American Spirit,” was repeated twice in his remarks. Republicans responded enthusiastically during the speech, standing and cheering throughout as is commonplace in such speeches, while Democrats remained silent except for a few notable exceptions. These included a recognition of a young survivor of a rare disease, and a long tribute to Carryn Owens, widow of Navy veteran Ryan Owens, who was killed in an unsuccessful raid in Yemen in January, who was applauded for over two minutes. After the Address, former Democratic Governor of Kentucky Steve Beshear, now retired, issued his party’s formal response to the joint session. Since 1989 until this latest response, such responses to a President’s first joint session address took place just four times, two for each party. He supported Democrats’ efforts to retain the Affordable Care Act (Obamacare), disparaged Republicans’ attempts to repeal it and said that current Republican plans do not meet Trump’s promises to provide insurance for everyone. 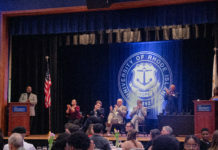 On Tuesday, Rhode Island Governor Gina Raimondo made a case for her two-year free college tuition proposal at the state’s economic summit, along with higher education officials like the University of Rhode Island’s President David Dooley and business leaders. Raimondo’s Promise Scholarship would cost about $30 million per year once fully implemented. U.S News & World Report, notorious for its education rankings, reported Rhode Island as number 21 in a list of the best states. RI ranked seven out of 50 in healthcare, and third in crime, but just 35 in infrastructure and 32 in economic opportunity. Last week, the Democratic National Committee chose Tom Perez as new Chair of the Democratic National Committee. Perez was a Secretary of Labor under President Obama. 235 of the committee’s 435 members voted for Perez, and 200 voted for Representative Keith Ellison of Minnesota. Late Tuesday night and into Wednesday morning, tornadoes and thunderstorms devastated parts of the Midwest just before or after hail and blizzards in many states. 15 states in the region had severe weather alerts as late as the early hours of Wednesday morning. Among the worst hit were Illinois and Missouri, where at least two were killed. Tuesday, China and Russia, permanent members of the United Nations Security Council, used their veto power to halt sanctions targeted at Syria after its alleged used of chemical weapons. UN investigations have found evidence of these chemical weapon attacks, but Bashar al-Assad’s government in Syria denies them. After the death of Kim Jong-nam, exile from North Korea and half-brother of Kim Jong-un, the nation’s leader, two women in Malaysia, Siti Aisyah and Doan Thi Huong, have been charged with murder. Kim Jong-nam is believed to have been poisoned with VX nerve agent, a UN-categorized weapon of mass destruction. During a speech by France’s President Francois Hollande, a police sniper mistakenly shot two people, firing just a few hundred feet away from Hollande. According to reports from the Associated Press, the officer’s safety was off, and he did not mean to discharge his weapon. The two people did not suffer serious injuries.